Another item in the growing roster of things to do this weekend is Greenpoint’s very own (and 13th annual!) 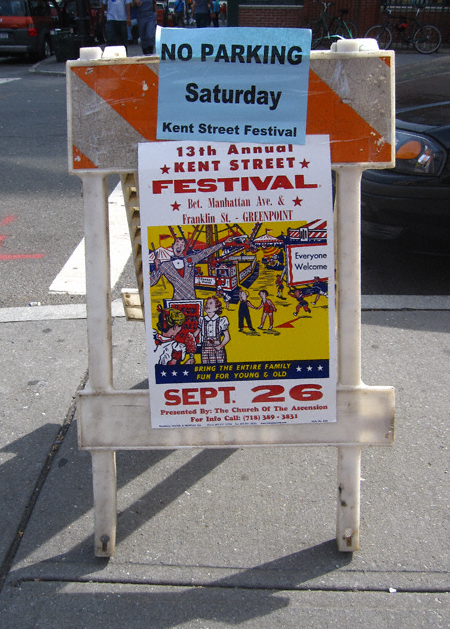 Kent Street Festival. I have attended this event on and off over the years. Despite what the above poster intimates this is a very child-centric affair. Face-painting, carnival rides and pony rides are among the usual staples. Bigger kids and bargain hunters might be more interested in the stoop sales, vendors (jewelry, clothes and not surprisingly sausage are prevalent) and bake sales. If you’re in the area swing by. It’s a nice (and inexpensive) way to while away an hour or two with the young ‘uns. Ah yes, every dollar store in Greenpoint on one block for a day, got to love it! My favorite memory of this event is my six year old neighbor, Mikey, basically convincing every old lady on the block to buy him a ride on that pony. He must have had 15 rides last year. I hope the economic downturn doesn’t hurt his chances this year. If you see a milky-white, blue-eyed kid soliciting you for a pony ride, just give in, his limitless excitement and laughter on that animal is worth every dollar!